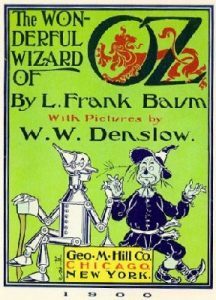 Such was the movie The Wizard of Oz, an allegory of the state of affairs we now live in today — an allegory of the unfolding New World Order that was instituted in America via the stock- market crash of 1929 and the bankruptcy of the United States in 1933. Persons are divided by law into natural and artificial. Natural persons are persons created by God, and artificial persons are persons devised by human law for the purpose of governing them as “corporations-of-one” or bodies-politic. The word “ace” is etymologically related to the word “axe” and in a deck of cards the only card above the King is the Ace − God. One of the Axis Powers of World War II was a fascist state, Italy. The symbol for fascism is the “fasces,” a bundle of rods with an ax bound up in it with its blade sticking out. Before the bankers stole America, they had longsince overpowered the Christian Kings and Queens of Europe and looted their kingdoms. Maybe “Professor Marvel” knew something about the future that other folks didn’t know. With a human skull peering down from its painted perch above the door to his wagon, the professor lectured When Dorothy Gale and her new friends emerged from the forest, they were elated to see the Emerald City before them, only a short distance away. The Wicked Witch of the West, desperate for the ruby slippers that Dorothy was wearing, would have to make her move before our heroes arrived safely inside the Emerald City gates. Between the years 1916 and 1933, America’s gold was absorbed by the private non-federal Federal Reserve and shipped off to the FED’s owners in Germany and England because the use of Federal Reserve Notes carried an interest penalty that could only be paid in gold. Our former currency, United States Notes, carried no such interest requirement, but such was the “bargain” that came with the New World Order of the nonfederal Federal Reserve in 1913. The American Bar Association is a branch of the Bar Council, under the Bar Association of England and Wales. (British Accreditation Registry) [Some believe it to be a religious association run by Esquires of the middle temple of the city of London – not as in London, England but a particular place in the city of London.] As the copyrighted property of a British Company, all states’ and United States Codes are private British owned Law, and all states’ and United States courts, state Bar Associations, and the “State of [name each of the 50 States],” go by and enforce private de facto British owned Law against Americans, operating as private foreign owned tribunals or administrative agencies doing business in the states under cover and color of [each of the 50 states’] Law. The Wicked Witch of the West wanted the ruby (silver) slippers (the precious metals) — and her counterpart, Miss. Gulch, wanted Toto, too. What does “toto” signify in attorney legalese? “Everything!” Miss Gulch wanted to take everything. The bankers did quite well. And, as the Wizard said, they made a killing in the America west with the theft of America’s gold, labor, and property from the grateful and responsive rural folk” (a quoted phrase of John D. Rockefeller) who populated the country at that time.